Following up an already great film is never an easy task, and some don't always hit the mark. Take Iron Man 2, for example. The first one was pretty much flawless - great acting, great plot, wonderful special effects, snappy dialogue and killer pacing. The second- not so much. It had all the right pieces on the game board; with Mickey Rourke as Whiplash and Don Cheadle a worthy replacement for Terrence Howard as Rhodey/War Machine, but it just didn't have the zip and zing of the first. Perhaps in its own right, its not such a bad movie, but once you've seen the first you can't help but wish it was just as clever and brilliant. Such is the burden on filmmakers with sequels; particularly second installments. There are benefits too - not being weighed down by character development and setting the stage, you can just push play and hit the ground running. The creators of Kung Fu Panda 2 used this benefit to their full advantage. Right from the start, you get a loving reference to a dearly departed character from the first film artfully rendered into the studio logo, and then BAM away we go. And WOW is the animation gorgeous; even more so than the first. 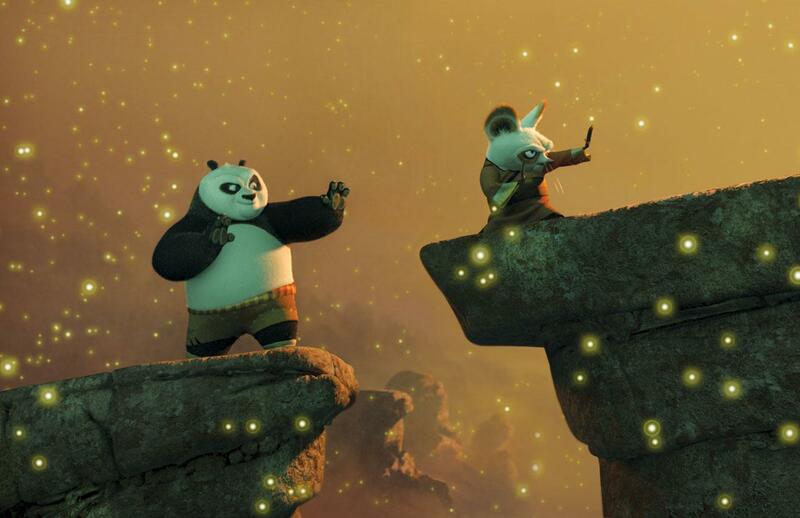 The textures in fur and the patterns in clothes are detailed to the extreme, and Po, though slimmed down a tad (all that kung fu will do that to you) is fuzzier and cuter than ever. The 3D well-worth the extra couple bucks on the movie ticket; it enhances rather than hinders the already dazzling animation. Things I loved about this film- more scenes done in the unique hand-drawn animation style that we got a glimpse of in the first film. It looks like ancient Chinese tapestries come to life. I also enjoyed the evolved friendship between Panda and Tigress, considering their relationship was definitely off to a rocky start in the first film. When I first read that the villain was going to be an albino peacock named Shen, I was like rather skeptical. But the ever-versatile Gary Oldman really rose to the occasion and made him menacing to the point of scary, especially to very young children. It was also a joy to hear more from Mr. Ping, voiced by James Hong, who will always remain endearing to me as Cassandra's Dad in Wayne's World 2. His character is a duck who owns a noodle shop and happens to be Po's clearly adopted father. He becomes a central character later in the first film and remains central in the second. And here's where the plot becomes tricky to navigate. As my boyfriend said to me after the film was over; I LIKED just having Mr. Ping be Po's Dad without a lot of explanation. And delving into one's mysterious origins is a well-trod plot path, and is tricky to make fresh, new, and well, not downright trite. But somehow, they did it. The sequence when Po begins to put the pieces of his past together (the flashback scenes rendered in that gorgeous hand-drawn animation style I gushed about previously) literally brought tears to my eyes. It brought home the idea that family is where you find it, which is a theme I think is too seldom seen in films. ]The action continues to be fantastic and well-researched, and a delight to see especially if you know anything about kung fu. 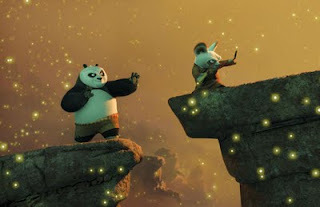 Watching Shifu, Po's teacher, do the Tai Chi move "Wave Hands Like Clouds" at the beginning of the film made me tingle a little inside with happiness. Overall, a solid follow-up with plenty of fun for kids and adults alike. Stay for the great animation during the credits! Very much looking forward to seeing what they come up with for DVD extras. P.S. Look for Master Croc, who gets a pityingly small role, voiced by Jean Claude Van Damme, do a signature "Van Damme" split! I feel like J-Chan didn't get many lines in the first one either, but I feel like the Furious Five except for Tigress in this one were still back seat characters. Overall, I was happy with this film even if Jack Black is a Skadooshbag.